February has been a month of friends and rain out here in Oahu. Our house has been bustling with guests and I have stayed busy exploring the island as the tour guide. I wanted to show my good friend Phoebe what Oahu snorkeling was like so we headed to the southeast corner of the island. I knew Phoebe was a great swimmer and free diver so we headed to the cliffs near the Halona blowhole. The waves were small, so the kick out from Eternity Beach was quite easy. We could feel a slight current but no "Molokai express" today which can be a dangerously powerful current ripping along the coastline here threatening to whisk snorkelers and divers off to the far off island of Molokai. 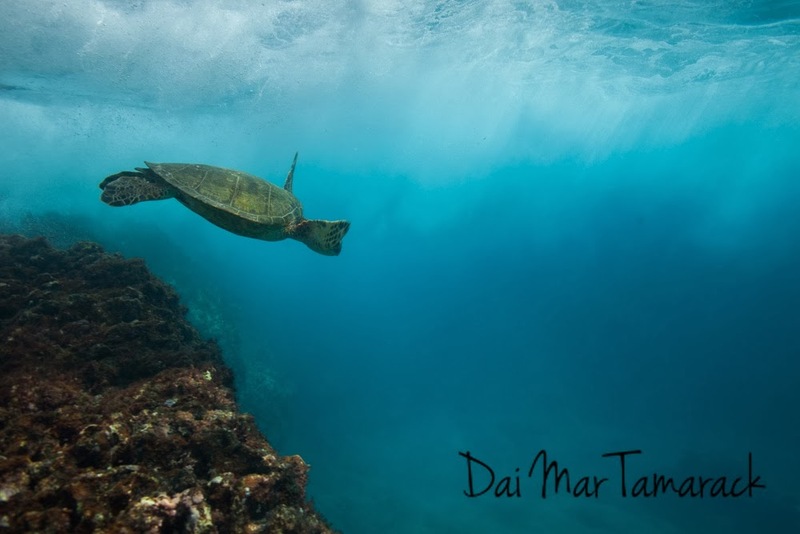 We kick against the current while following several green sea turtles out into the blue. The water clarity was great so we stayed in the deeper water until eventually circling back along the cliffs. The cliffs here rise up over a hundred feet and plummet down another forty feet underwater. A few miles back at the popular Hanauma Bay you might see hundreds of people wading into the water, but here at Eternity Beach it is not unusual to have the site all to yourself. That is easy to appreciate when you are hanging out with some friendly turtles and listening to whales sing in the not so far distance. Swimming with dolphins is always such a pleasure. 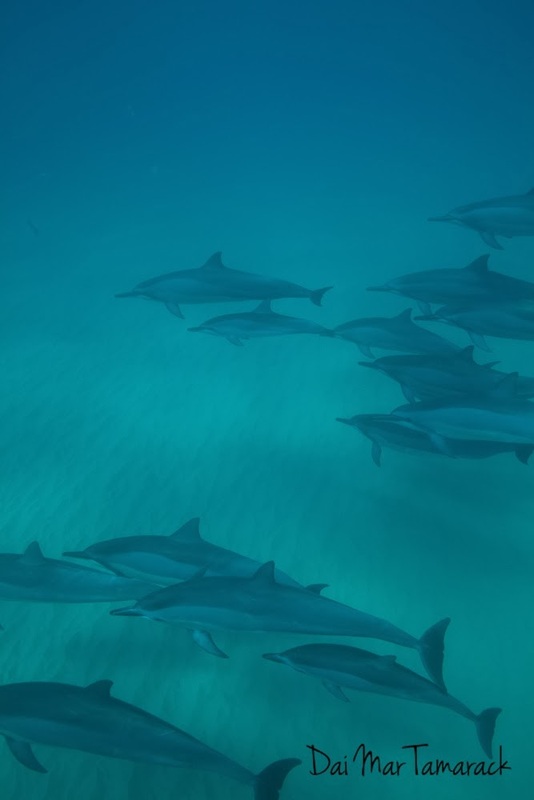 These pictures are of a pod of Hawaiian spinner dolphins (Stenella longirostris) that frequents the western shore of Oahu. I haven't seen them the last few times I have been over to that side so I was pleasantly surprised to see them playfully leaping out of the water just offshore. I had my kayak and snorkel gear so I loaded up my gear in the kayak and shoved off in between sets right from electric beach. A couple of snorkel boats were zooming in to check out the dolphins so I headed farther offshore to where I saw a whale blow. I was hoping to get to see some humpback whale action but after one sighting of two blows from about 500 yards off I never saw them again. But it was a beautiful day to be in the kayak and the slight breeze felt great. After a while I paddled back in to where the dolphins were still playing. 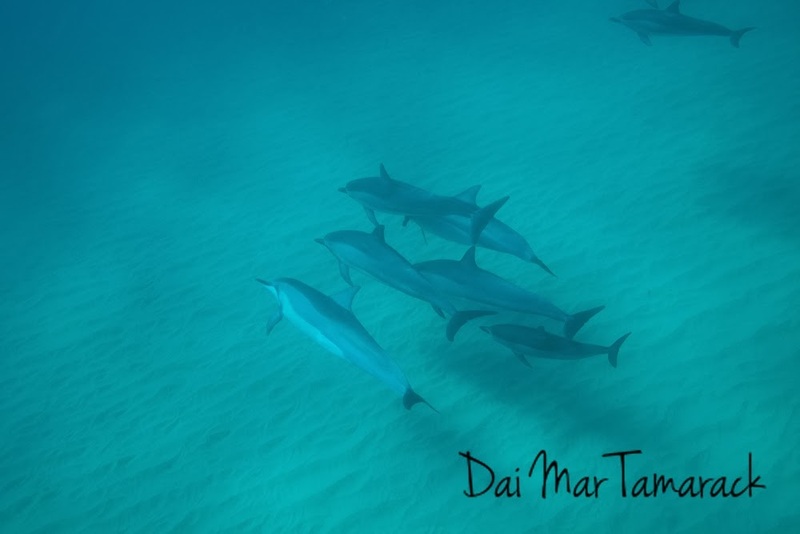 As the dolphins turned to swim towards me I slipped in the water and peered into the blue. It took a few moments but shapes soon emerged from the edge of my vision. 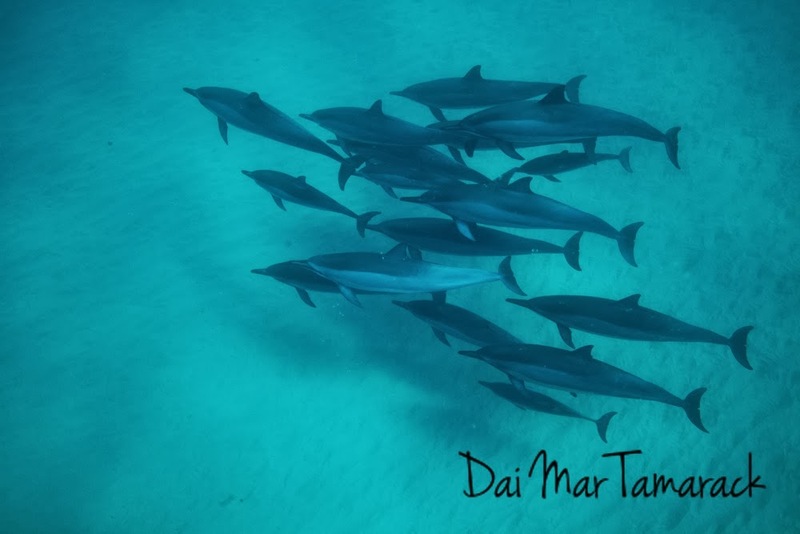 Dolphins swimming close together in several groups cruised by with only a few audible squeeks. This is their resting mode so I made sure not to chase or harass them as they passed. I must have been in a good spot though because just when I thought I had lost the pod they would reemerge nearby on the surface or back out of the blue underwater. They gave me several opportunities as they passed to soak in the experience. 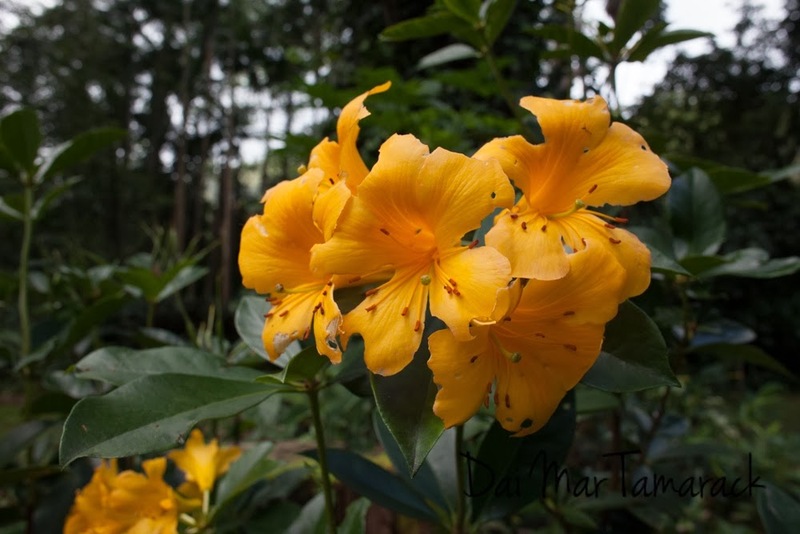 Hidden in the back corner of beautiful Manoa valley is the Lyon Arboretum. 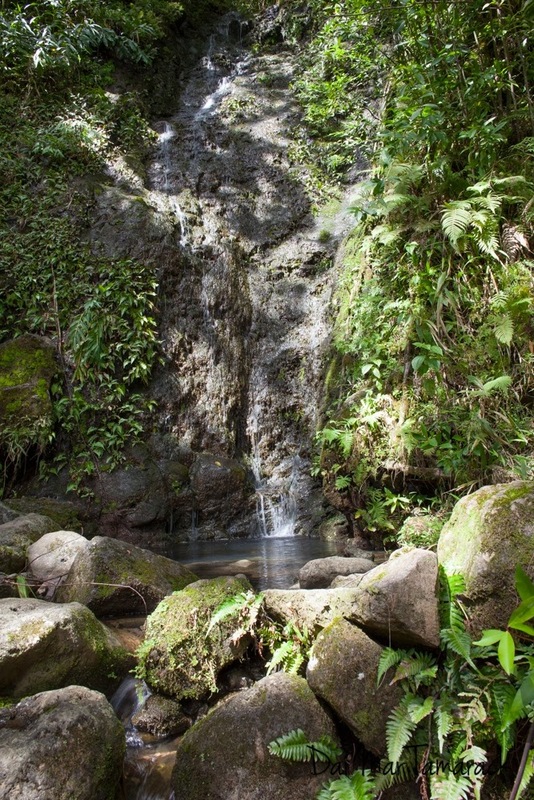 For the nature lover it is set in a lush rainforest with a small waterfall at the end of the trail. For the birder it may be your only chance to spot white cockatoos and green parrots screeching in the tree tops. And don't even get me started for the plant lover. 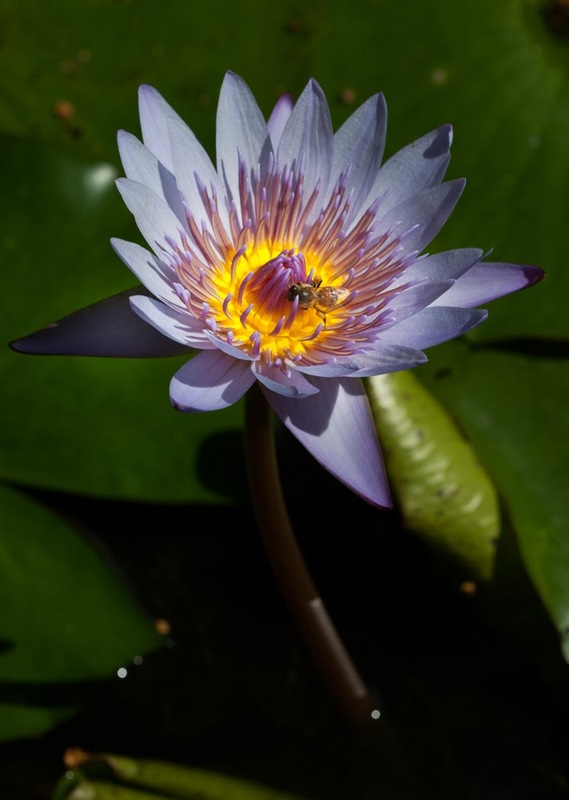 From water lilies in small ponds, to entire gardens of bromeliads and heliconia, this garden has it all. 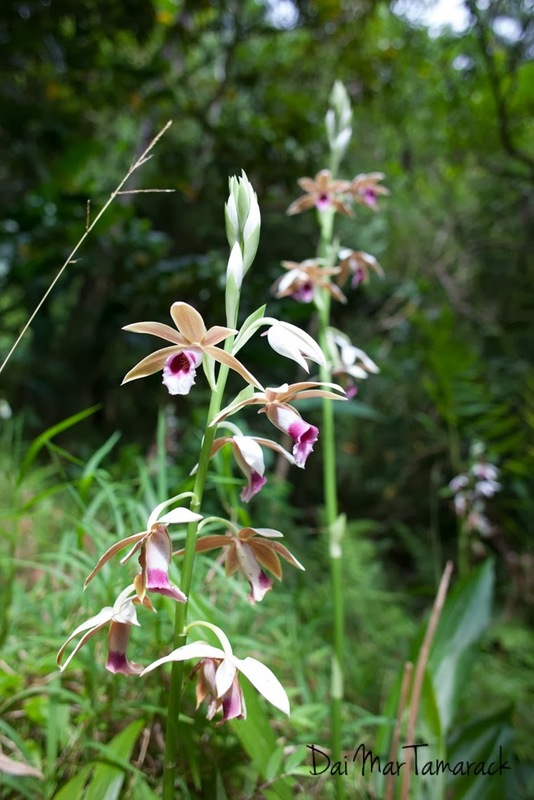 Orchids grow wild up in the trees and down on the ground, and some time in the next 40 years their two Halipot Palms are going to put on one heck of a blooming show. 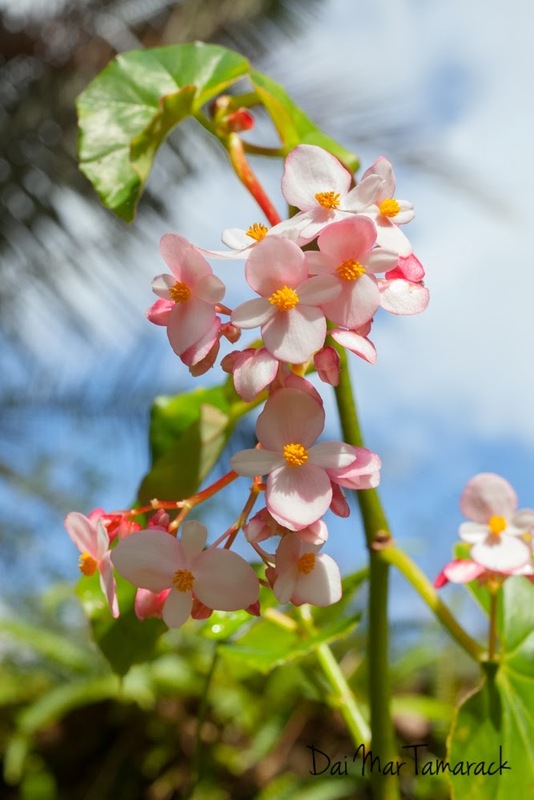 Started in 1918 by the Hawaii Sugar Planters' Association (HSPA), the Lyon Arboretum began as a reforestation effort to protect that valuable watershed. In 1953 Harold Lyon urged the HSPA to transfer ownership over to the University of Hawaii with the stipulation that it will always be used as an arboretum and botanical garden. 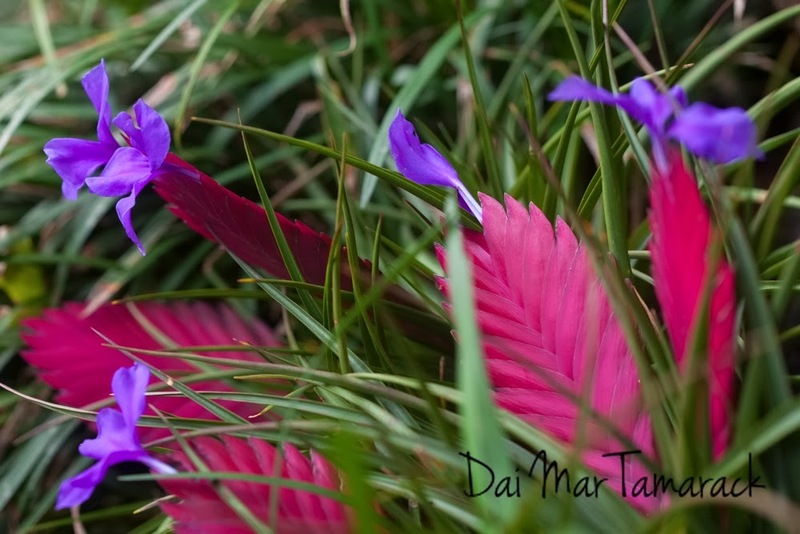 The number of plants is almost impossible to take in during just one visit. Especially since the elevation of the gardens slope up from 600ft to 1600ft! You can see a lot with a nice easy stroll through the lower sections but some of the small trails that branch off contain some pretty amazing sights. 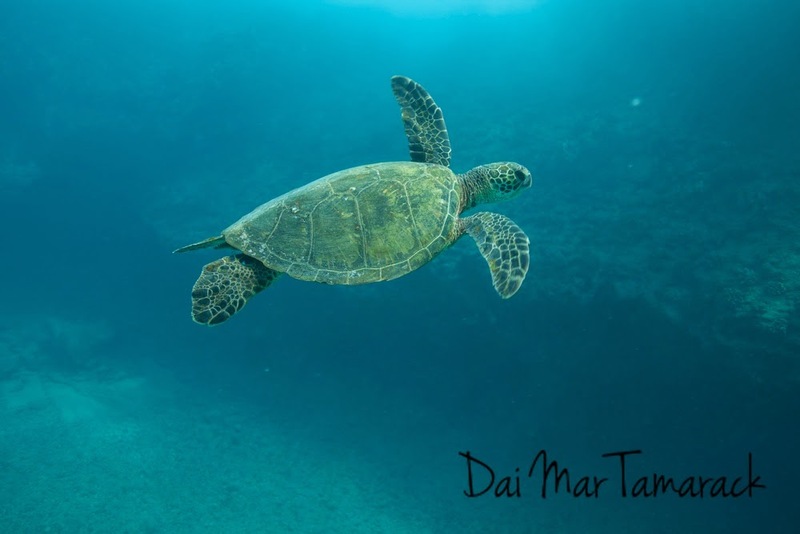 If you are a wildlife lover and think Hawaii has not much to offer then think again. 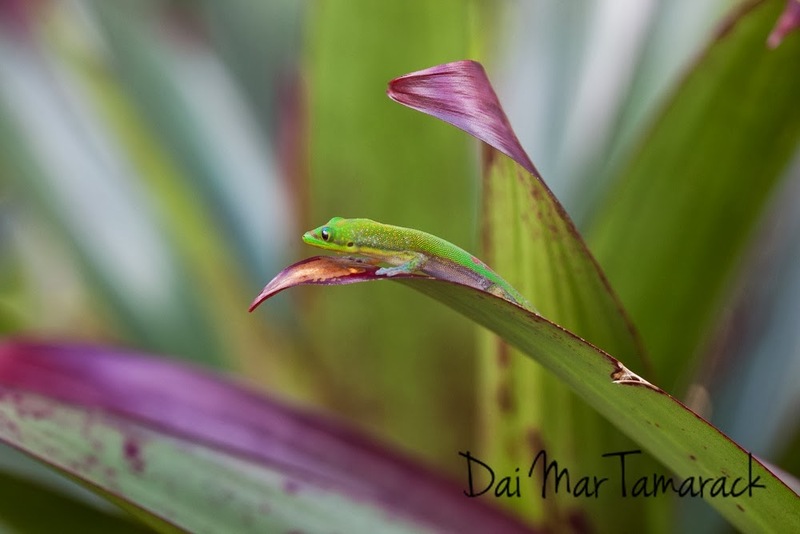 On a recent trip to Maui I was able to see some of the biggest wildlife and some of the smallest in the same day. Right now the oceans are thick with humpback whales mating and having babies. I saw quite a few in between Lana'i and Maui on my flight in from Honolulu. And I couldn't wait to get up close on one of the whale watching boats with my friends at Pacific Whale Foundation. The whales did not disappoint. On a two hour whale watch I saw breaches, tail slaps, peduncle throws, pec slaps, fluke up dives, and brand new babies. I still think that Maui has got to be one of the best places in the world for whale watching during the months of February and March. Seeing 40 ton animals launching out of the water is pretty amazing, but my other goal while on Maui was to find the tiny I'iwi bird. It is a rare, endemic honeycreeper that lives high on the slopes of Haleakala. It can be a bit of a treasure hunt but a good place to start is the nature trail at Hossmer's Grove. 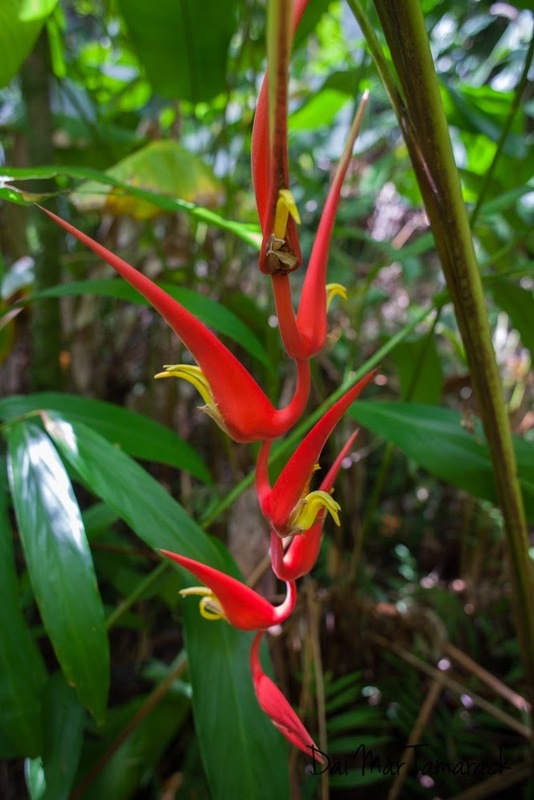 Located just inside Haleakala National Park, the trail leads past a ravine where bright red and green birds flutter from tree to tree. Most of these birds can only be found here in Hawaii. Sometimes I feel like all my luck gets used up in one fell swoop. 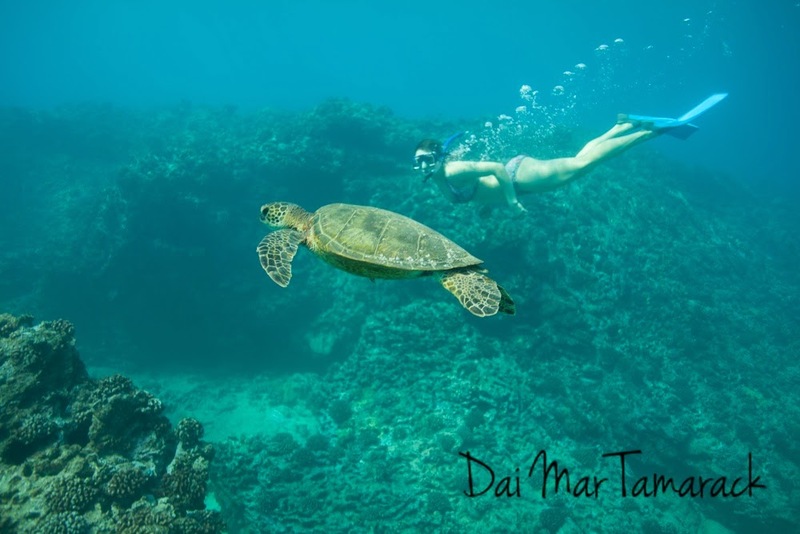 Take for example this latest experience in the water off Maui. 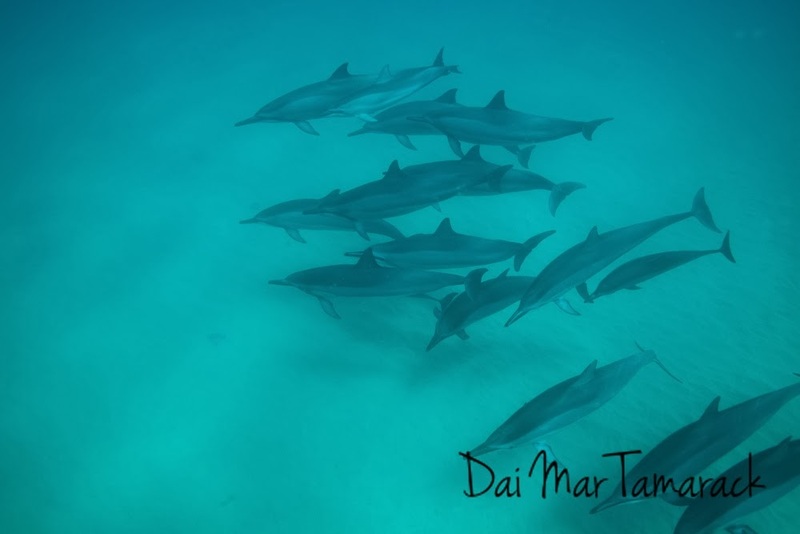 I swim out to test my new camera and who should show up but a very playful group of Hawaiian spinner dolphins. I have swam with them before but this time was different. Instead of cruising back and forth in a 300+yard area, this pod was circling in the same spot. I counted around 30 dolphins, many of which were playing 'keep away' with bright orange leaves. They would swim with the leaves on their pectoral fins, tail fin, dorsal fin, or even the tip of their beak. 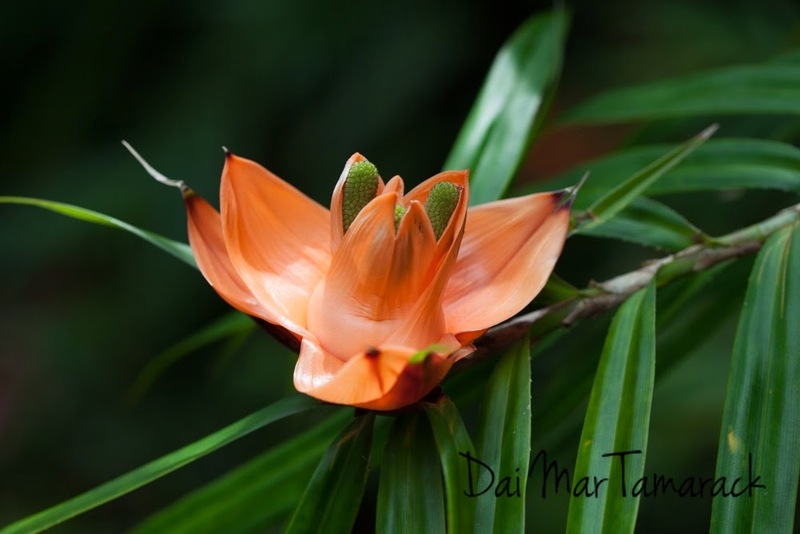 Every once in a while a leaf would shake off and the dolphin would circle back to catch it again. At one point I noticed one of these leaves floating next to me, so I grabbed it, made a few circles with it and then tossed it out away from me. Low and behold one of the dolphins eventually made its way over and swooped up the leaf. I have never had such a playful group of dolphins interact with me before. Needless to say it was a great way to test out the new camera rig. The water was a bit murkier than normal due to the heavy winter rainfall but it cleared up enough out deeper. My friends Nate and Jen were out with me this morning as well. 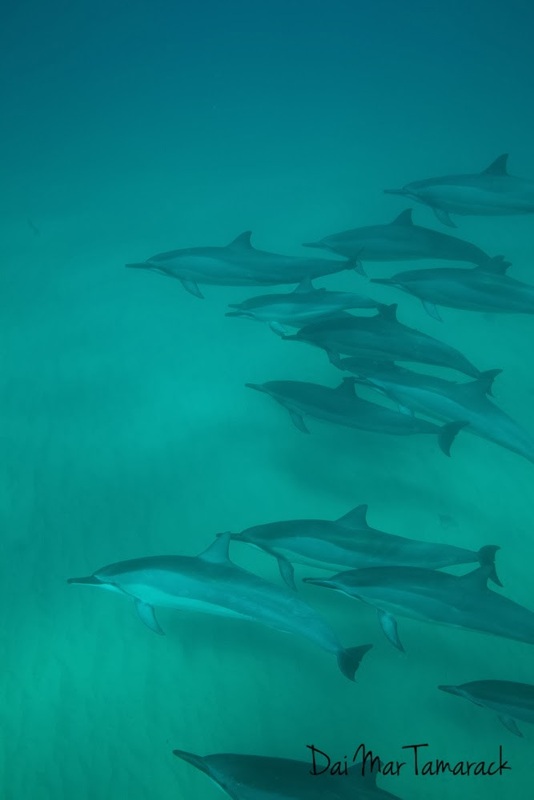 Nate had his underwater camera and is a great freediver so I was able to snap a couple pictures of him down with the dolphins. There is always something very special about being in the water with such intelligent, beautiful creatures. No matter how quick a trip to Maui might be there will be hidden gems found and great times had. After a little snafu with my flight I made it standby to Maui, picked up my rental car, and rushed off to meet my friends on the road to Hana. 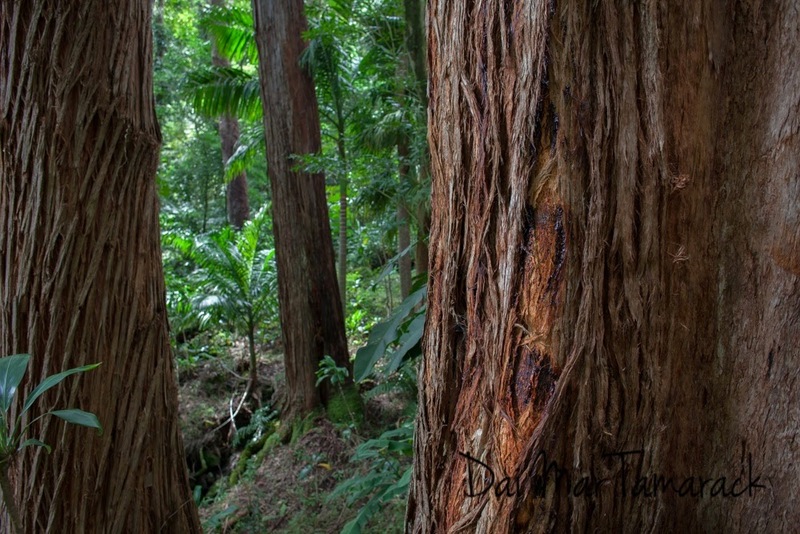 We met at Frog Pond, one of our favorite swimming holes near the beginning of the road to Hana. After some rock hopping and cliff jumping here we decided to check out the hidden waterfalls at mile 11. I'm not sure what the name of these falls are but there are two of them, each with their own swimming holes. It is just off the highway but separated by lush jungle. A rope swing beckons the adventurous and rocks warmed by the sun give you more than enough reason to while away the afternoon. We were hoping for an early morning sunrise hike somewhere on the southeast shore of Oahu but mother nature had other thoughts. Once we crossed over to the windward side of the island the rain became pretty consistent. Not to be deterred we drove down the coast until we hit Sandy's Beach park. Known for its pounding shore break and body boarding it also turned out to be a great place for sunrise pictures. I was hoping that the sun would poke up in between the cloud layer and the ocean. While it didn't do exactly what I wanted it still gave me some nice colors to work with. I got these pictures during that magic hour by standing very close to the waves breaking over the lava rock shelf. A long exposure was used to capture a feeling of the movement of the waves over those lava rocks. I knew we had a good location for the sunrise shoot when I saw a van full of people on a round the island photo tour pull up next to us. What a final day at the Volcom Pipe Pro. The rain stayed away, the sun came out, and the swell came in. Competitors from the North Shore like Mason Ho competed against surfers from as far afield as Brazil, France, and Puerto Rico. But the standout of the competition was 11 time world champion Kelly Slater. I lost count of how many times Kelly would disappear behind a wall of water only to emerge unscathed 6 or 7 seconds later. It was no surprise seeing him win the entire competition. The surfer nipping at Kelly's heels was young Mason Ho. He comes from a very famous line of North Shore surfers. His father is Michael Ho and his uncle is Derek Ho. Mason's goal is to be bigger than both combined. The waves were the best I have ever seen at Pipeline. A south wind was blowing offshore causing the barrels to form and hold open for the surfers. The lefts were huge with spitting barrels and the rights at backdoor had some gems as well. Some of the waves were easily 20ft on the face. Guys were standing up clean in the barrels. There were plenty of wipeouts, with two broken boards, and even one surfer carried off to the hospital with a broken ankle. These surfers were making it look quite easy but the conditions were definitely risque to say the least. I stuck around for a few hours and saw more barrels than I knew what to do with. It was amazing to see the wave working so well, like in the movies. There were some epic rides and I did my best to capture the action. Luckily, pipeline is a huge wave that breaks abnormally close to shore in very shallow water. Very good for observers on the beach and one of the best waves to take photos of. Check out the barrel shots and see some of the amazing action for yourself.